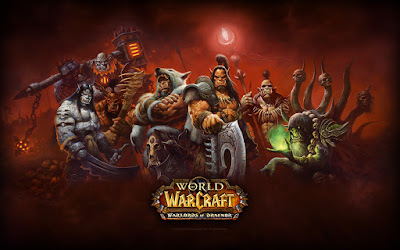 After flying through Mists of Pandaria in one play session I jumped to Warlords of Draenor. The story hooked me much more in this expansion. It feels like the first time that the World of Warcraft team was actually good at telling a story instead of just setting up a scenario. I bought into the premise and had a lot of fun the first night. Playing through the start of the story with all the cutscenes and digging into garrison building was a ton of fun. Then night two hit and I was essentially back to grinding on quests and the dungeon finder. The leveling was slower than Mists so I actually got to sample all the zones. I think I 100% the first zone and I did random quests in all the others. But again, dungeon finder became the most fun because the drive of the story got lost in the shuffle. Night three found me almost give up on WoW again. I was getting bored. Quests, gameplay, and dungeons were all blending together and just feeling the same. But then a friend mentioned that I was only one level away from being able to jump over to Legion. I figured if I bought the expansion and the game time I should at least give Legion a shot with the character I was enjoying the most. So, in the end, I almost got bored enough of WoW after 4 nights to stop playing but Legion saved the day. I jumped over to that and started on the intro quests that have a lot of story and cutscenes. Now I'm invested for at least one more night. I'm going to play Legion and see how far I make it. My main problem is that the gameplay isn't changing at all. This is the same game I've played before. I can tell I'm not going to make it too much further before I set it down. Hopefully I can sample a decent portion of Legion first. Considering getting rich in World of Warcraft? You really need to Install the DYNASTY: TYCOON GOLD ADDON. It will automatically suggest the BEST gold strategies in the game, in seconds. ULTIMATE WoW GUIDE has produced the ULTIMATE in-game guide for the gold hungry World of Warcraft players that desperately want to reach the highest level and make piles of gold. Unlike PDF methods our unique guide works inside the game, to constantly tell the player what to do, step-by-step.